Does this look like a belt issue would you say? 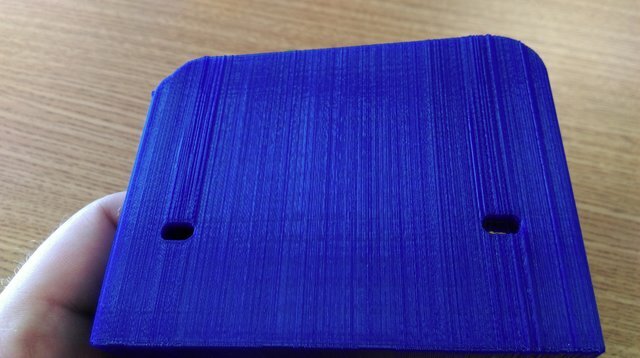 I've got over 1200 hours of print time on this machine, could the belts just be wearing a bit? The way the pattern is different at the holes - that could definitely be a belt issue. 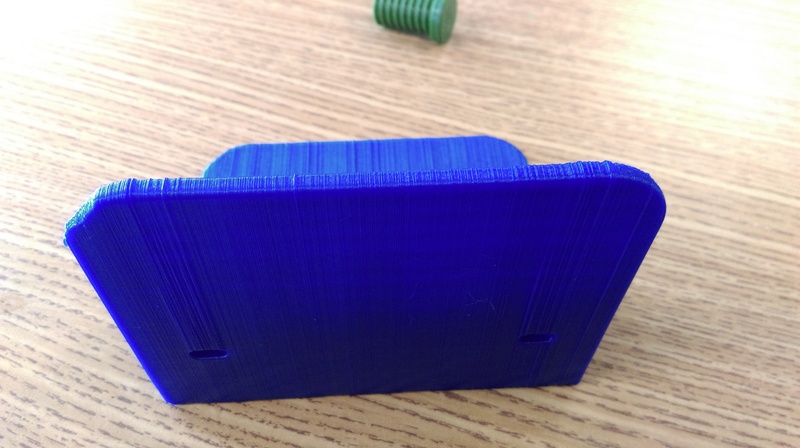 The many many horizontal lines (turned vertical for the photo) are caused by Z issues - some layers the z screw doesn't move enough and you get over extrusion because you are printing too much plastic into too small of a space and then the next layer it corrects and moves farther. Try adding a drop of light oil to each of the 2 Z rods and with power off push the bed up and down 5 or 10 times past the oil. Check for bad spots where it feels rough. Then add a drop of green grease to the threaded z shaft. Check that all the screws are tight *under* the bed - especially the 4 on the z nut. I think you have to remove the cover that says "ultimaker" on it just above the back of the bed to get to the screws for the 2 linear bearings. I try to stay on top of light oil and grease. every 50-80hrs of runtime or so, i do a clean and reaply. I pulled the bed assembly screws, and even removed the Z nut, hoping maybe some plastic had found it's way into the threads. everything seemed fine. There is some light wobble to the z nut , is that normal? Got everything back together, belts "seem" fine to me, I have 5 printers, fairly familiar with proper tension, and they feel about the same as my other UM2 that is working great. Did I read somewhere that on the UM2's you adjust tension inside the square brackets? Or is it still just a matter of adding tensioners? Anyway, after take apart, cleaning, checking every pulley set screw and reassembly. It seems unlikely it's belts as belt issues tend to be consistent layer to layer. Unless some layers are clockwise and some are counter clockwise which is unlikely with cura. I still think it's a Z issue. This can also be caused by temperature issues by the way. I would watch your temperature constantly while it prints these layers. There are some changes to the firmware that makes the temp vary by quite a bit - like 10C which is plenty to cause this pattern. This bug (temperature fluctuation) is fixable with firmware but first figure out if you have a temp issue or a Z issue. Also if your filament varies in diameter by a lot you can get this so try another filament. 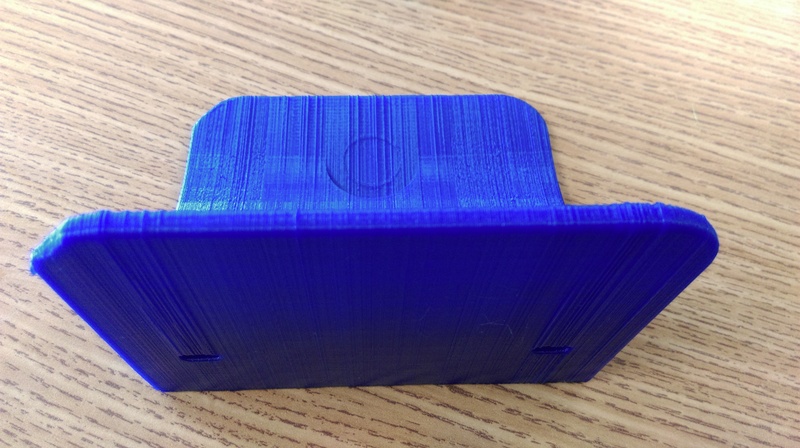 Have you put any oil onto the Z axis slide pillars? I would remove it if you have. See my thread earlier on. I have been fighting this battle for the past couple weeks to no avail. The temp seems to hold steady, it fluctuates a degree or two but that is normal. Same effect with any material. do you think there is a chance the z motor itself would cause this if it's failing? Also, the brass bed nut that rides on the threaded rod, is there any way that could be worn down enough to cause this? I don't see a replacement on the site, does anyone know the specs or where to find a replacement? Would not have thought the nut would be worn, when you think about it it doesn't get much wear, up and down once a print, not at any great speed. My Z banding problem is concentrated though a band 10-25mm, unlike yours. If it's not the temperature then it's almost surely the Z. Sometimes it doesn't move far enough and you get an extra fat layer that sticks out, then it moves a little too far on another layer and it underextrudes slightly and so on. I would try cleaning it with WD40 and then re-greasing it. Also lubricate the two vertical rods with light oil (not wd40 - that's for cleaning only). Any light mineral oil is fine. 3-in-1 oil. Sewing machine oil. Even baby oil is probably fine. I am very particular about cleaning my machines, I clean and regrease all the threaded rods routinely. Using white lithium grease, and sewing machine oil on the smooth rods. I have since day one, and it was the first thing I did when this issue started showing up. Damn. It really looks like i'm stuck on this one. I can take the same gcode, and the same material over to my other um2 and it runs fine so we can rule those out. The bed travels very smoothly by hand up and down on the smooth rods when the nut is removed, so I think we can rule those out. It is far less smooth when the nut is attached. Like the motor resists a bit. Do we have a place to source the exact motors? Can I suggest a crazy unrelared idea? How hot it's your room temperature? I had some z problems and weird stepper moves and was just because the room was at 28C + and now with the airconditioner on cooling this spanishsummer it's working just perfect. I have 5 printers, one other is also UM2, issue is only on this one, so I don't think that is it. There is some light wobble to the z nut , is that normal? I don't know. You could compare to a working printer but I'm sure you don't want to take one apart. What country are you in? It's not in your profile settings. I would contact support.ultimaker.com. It seems to me it could still be the vertical rods, the linear bearings on those rods, or the Z nut, the Z screw, or the Z stepper. It would be nice to swap those things with a working machine. The Z stepper and the Z screw are one piece I believe. So you remove the 4 screws on the bottom and unplug the wire and the z stepper/screw assembly can go right out the bottom. Easiest part to change. I'd be tempted to swap Z nuts at the same time. neotko has an interesting point. Those stepper drivers can get quite hot. But if that was your issue I would expect the problem to go away the first 10 minutes of printing because after a print is over the axes are all powered down and the driver would start to cool down. I can rule out temperature/speed, filament, slicing or firmware issue. I highly suspect that the problem resides within the Z axis (Z threaded rod, Z motor or Z driver). - It happened randomly. I was printing fine, then my UM2 started to print like this. - I removed the threaded rod from the machine, cleaned with WD-40 and re-greased with supplied grease. The two sliding pillars are oiled properly. - There is no resistance or bump when I manually move the bed up and down. - All belts are nicely tensioned. - Printer works perfectly except for the Z banding issue. I get this when i print too hot and too fast. or just too hot mainly. 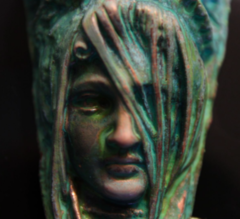 if you can print slow and high rez without these issues, then its just finding some good middle ground. Ill post some pics to demonstrate, but i really think you are simply printing far too hot. therefore the stripes will be random due to the excessive temps cooling the filament randomly as it is essentially overflowing on the model as its getting layed down. 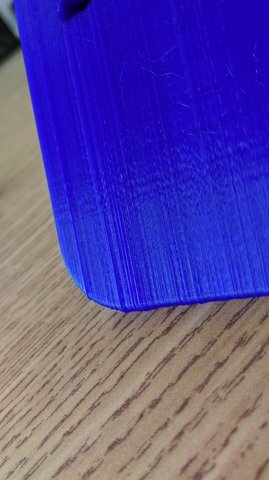 I also only get this printing 0.2 layer height as that is when i tend to ramp up the temps to allow for better material flow and also speed up the print. So you are essentially lowering your quality to get more done quicker. You need to experiment to get the best you can thats all. P.S. I doubt its the teeth, i found that with my cura the left side is not accurate, and if i put an object too close to that side, the head cant physically go there as it hits the side or the casing so it grinds the belt and jumps teeth i have to quickly stop it as too much of that and i WILL need a new belt, but its happened quite a lot and still i get perfect layer height so they are quite tough and can take a bit of a beating or grinding. You haven't posted any settings and without saying what you use no-one can easily help you. @joseph-kim check that the bed isn't too loose. Tight a bit the z screws (the ones to level). If the bed it's loose the vibrations can make the bed wooble and created Z lines. Also clean the z screw of the motor and reapply the green grease lube. 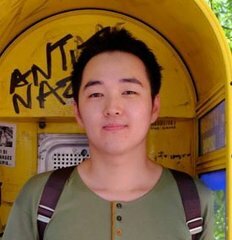 @joseph-kim - what's your layer height? It looks like .4mm? What's your nozzle diameter? Is it the standard .4mm or did you change nozzles? Please post *all* your settings. 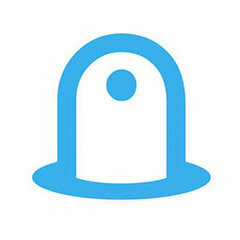 You should be able to "save profile" to an ini file and post that. That lowers the max Z current to 1000ma (I think the default is 1300). 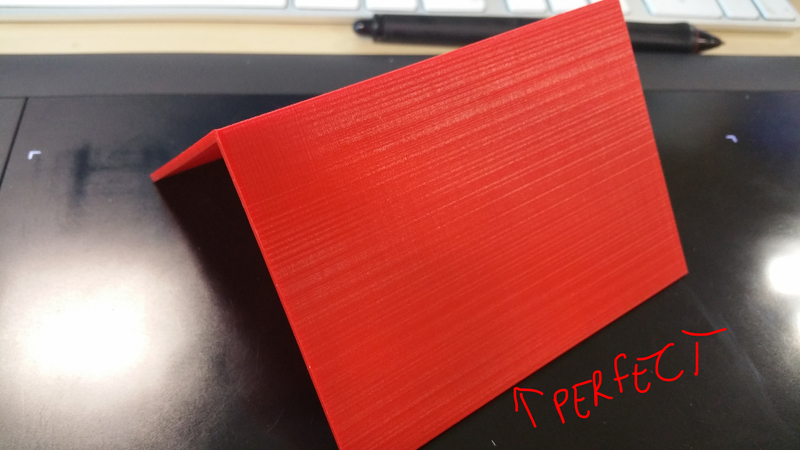 Printed at 215 0.06 70mm/s (hence the maechanical lines, but its real smooth. Your problem is heat. You are using a too high temp. cloakfiend - I agree that heat can do this and is probably axislab's problem but in this other guys case he has a much more extreme case of varying layer thickness - by what looks like a factor of 2X (double extruding). I think this is more likely a Z issue but I still want to rule out that he set layer height to .4mm and it is in fact a heat issue like you say. 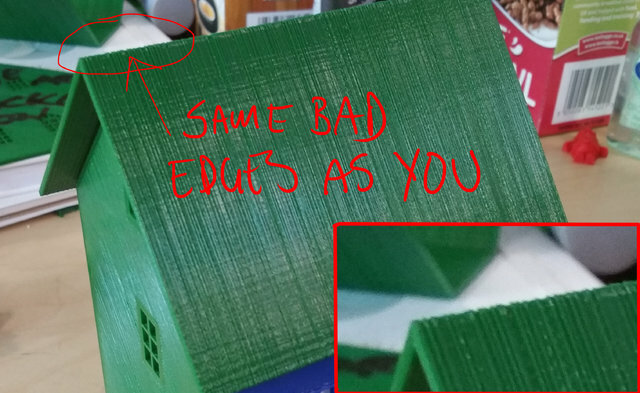 I guess printing the same object twice and seeing if the lines are in not the same place will rule that out. If they are then it is the Z.
Id put the varying line thicknesses down to all the other factors related to grinding and slow jams, and slightly blocked nozzle, that can build up and then suddenly release more filament hence a thicker layer spilling over more than the one before it. 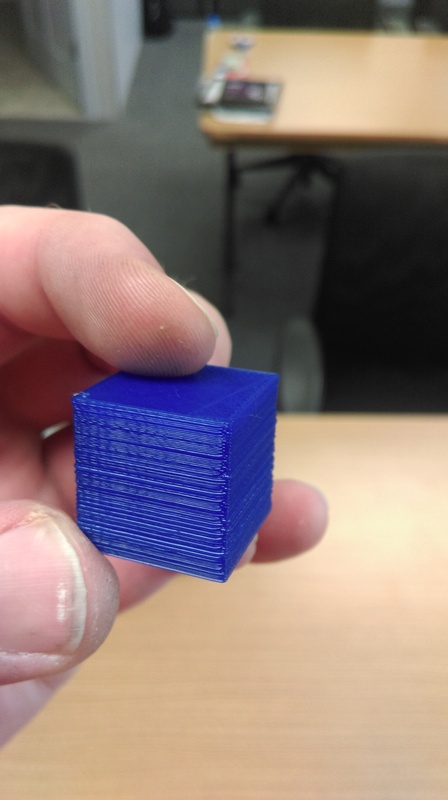 Try printing cooler, if you cant cause of clicking, then your nozzle is jammed, even slightly. And i've had much worse looking lines than this guy, i just didn't take any photos as I already knew what my problem was. Thank you guys for helping out! 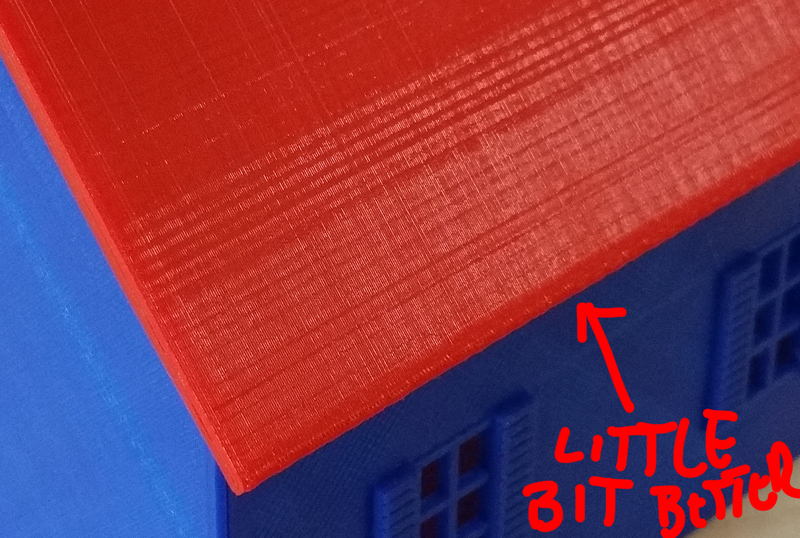 - My layer height was 0.1mm for the "horizontal banding test towers" and 0.2mm for the rest. - I've tested with temperatures ranging from 200 to 250, with Ultimaker PLA, Colorfabb PLA/PHA and Faberdashery PLA. All combination leads to the same result. @neotko I even took out the brass nut and the threaded rod assembly and cleaned and re-greased it thoroughly. All three Z thumb screws are on tighter side to reduce vibration. I don't think it's bed leveling issue either. @gr5 I am using the Olsson block that I got from gr5 store. I was printing fine with the Olsson block for the past month. I took apart and reassembled the head assembly just in case, but nothing changed. I will try printing 10mm tall object and measure with my caliper. I will also try adjusting Z current. @cloakfiend I cleaned out the nozzle thoroughly and I am easily getting 10 mm^3/s flow. I will check the nozzle for any slight blockage and try printing cooler. Thank you all, and I will post some test results later. Thats a shame, have you tried printing things twice, at the same time and individually? And if so, were the lines in the same place? I guess if they aren' tthen i dont know but if they are then you can start digging for solutions. You need to find a consistent variable that you can work from. Or else you will just be guesing like the rest of us. If you can get exactly the same result twice, then you can start looking for fixes. Good luck. Ill let you know if i think of anything. Maybe your heating sensor has died? Just a guess.